This weekend in the Catskills and surrounding area: a Mozart concert, art opening receptions, a comedy performance, and a centerpiece design workshop are among my top choices. Hudson Valley Philharmonic will perform an all-Mozart program this Saturday, March 28 at 8 p.m. at the Bardavon Theater in Poughkeepsie, Dutchess County. The program, conducted by Leif Bjaland, includes Mozart’s Symphony No. 35, and Piano Concerto No. 23, among other masterpieces. The Bardavon Theater is located in a historic building designed in 1869, the oldest continuous theater in New York State. Mark Twain and other luminaries performed on its stage. In 1977 the building was listed on the National Register of Historic Places. It has been the home of the Hudson Valley Philharmonic since the 1970s. The Hudson Valley Philharmonic was founded in 1932, and performs numerous concerts throughout the area. For more information about this concert, go to http://www.bardavon.org/event_info.php?id=734&venue=bardavon. Longyear Gallery in Margaretville, Delaware County, is hosting an opening reception Springing Forward, this Saturday, March 28 at 3 p.m. Springing Forward is a group show featuring about two dozen artists affiliated with the gallery. Works in all media – oil paintings, watercolors, acrylics, mixed media, collage, ceramics, and photography – will be on display. Participating artists include Margaret Leveson, Helene Manzo, Ann Lee Fuller, Ellen Wong, Elaine Mayes, and others. For more information, visit http://myemail.constantcontact.com/Spring-Forward–group-show.html?soid=1102247844716&aid=qVA4TgOMKA8. Still in Margaretville, The Open Eye Theater is hosting a comedy performance Make ‘Em Laugh Saturday, March 28 at 7:30 p.m. Make ‘Em Laugh, a fundraiser for the theater, will put in the spotlight some of the best known local actors and friends like John Bernhardt and Jill Ribich. For more information about this performance, visit http://www.theopeneyetheater.org/current-season.html. Albany Institute of History and Art is hosting an opening reception Walter Launt Palmer: Painting the Moment Saturday, March 28, an exhibit that will remain on view through August 16. Palmer was born in Albany in 1854. He was influenced by the Hudson River School of Painting, and at one point shared a studio with Frederic Church. The Albany Institute of History and Art holds one of the largest collections of Palmer’s oils and watercolors. The exhibit Painting the Moment is a broad overview of his work, and includes paintings from his travels to Europe, building interiors in Albany, and winter scenes. For more information about this exhibit, visit http://www.albanyinstitute.org/walter-launt-palmer-painting-the-moment.html. Olana mansion in Hudson, Columbia County, is hosting a workshop Spring Tablescapes this Saturday, March 28 from 10 a.m. to 12 noon. Author and artist Marlene Marshall will walk with the participants on the estate’s grounds, and look for fungi, flora and other forest vegetation that could be used to design aesthetic table centerpieces. Pre-registration is recommended. 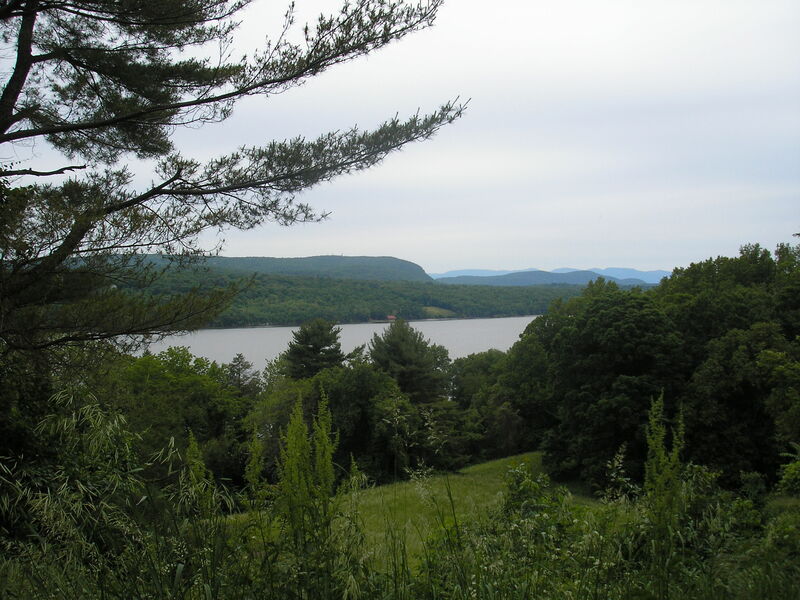 Olana was the home of Frederic Edwin Church, a leading exponent of the Hudson River School of Painting. For more information, visit http://www.olana.org/calendar/spring-tablescapes/?doing_wp_cron=1427377069.9718999862670898437500. Have a gorgeous Catskills weekend! I interviewed Juliet Harrison, an artist and owner of Equis Art Gallery in Red Hook, Dutchess County. Juliet grew up on Long Island, and worked for some time in New York City in various custom photo labs. She has a degree in Psychology, and an MFA in Photography. 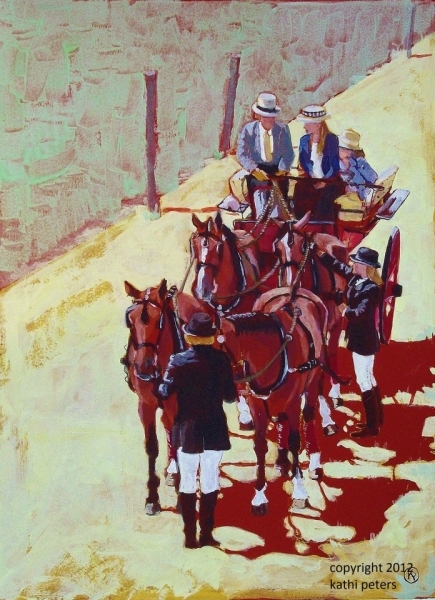 She was exposed to equine art when she was five, and equine art became a lifelong interest and passion. Nowadays Juliet photographs horses, and runs Equis Art Gallery in Red Hook, Dutchess County, a space entirely dedicated to equestrian art. © Juliet Harrison. Contributed Photo. Simona David: Juliet, please tell us a bit more about your background, and your interest in both art and horses. Juliet Harrison: Horses first, I guess. I was one of those little girls who were totally horse-obsessed from a very early age. When I was five I was given a wonderful little book of photographs of horses. It fascinated me. And, I rode horses as a child, and then later, after I turned forty, I began riding again. The art interest has always been there as well. I grew up on Long Island, but my parents and I spent a lot of time in museums in New York City and Europe. SD: You say that art is a craft that moves one in ways one had not thought possible – I’m paraphrasing. Would you like to elaborate? JH: I think of fine art as more than a little description of something, but something that has more depth and can convey a story, an emotion, an interpretation beyond the literal representation. SD: You do refer to the fact that art is something that moves us in a certain way. Traditionally speaking, beauty had been central to art, but in the 20th century we rather shifted towards expression as central to art. But whether be beauty or expression, art is still something that moves us in a certain way. JH: Absolutely. An artist creates a piece of art for their own needs, and to convey a message that they need to get out into the world in a visual form, or if it’s music, in an auditory form, or in a literary form when it comes to writers, but the artist interprets the work through his or her own experiences, and rather creates a dialogue between the artist, the artwork and the viewer. SD: About photography you say that it’s “the process of distillation and elimination.” “My photography is more poetry than prose.” Please, explain. JH: This goes a long with what I said before. But also with my own photography – I choose to work in black and white. By eliminating color, I reduce the elements that I have to work with, and each choice I make becomes more powerful. That way each photograph is reduced to its most salient pieces, and everything in that image has to speak to what is it that I want to say. 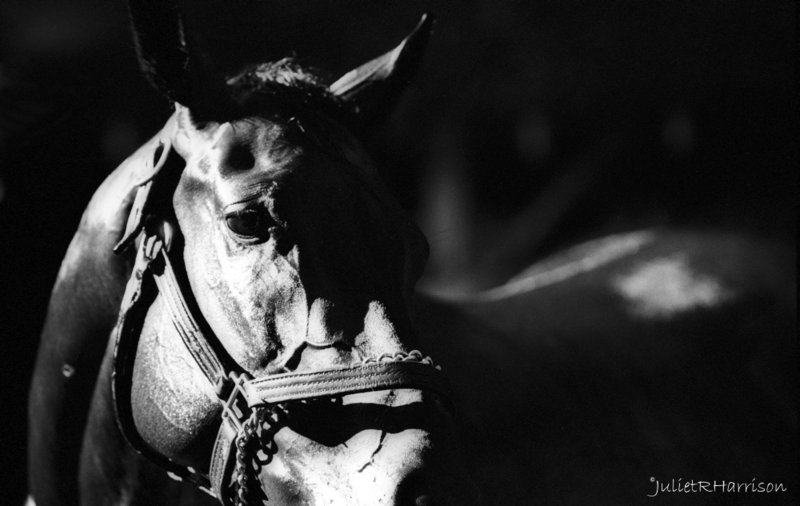 I don’t take pretty pictures of pretty horses; my photography evokes something more, and goes beyond the literal representation of the subject; that is difficult to do. How I shoot a scene and what I choose to show to the viewer becomes more important than how I print the image. SD: Cinematographer Gordon Willis was talking about black and white movies, and was saying that, in film at least, color can be distracting – it could distract the viewer from the message. It looks like you feel the same way about photography. JH: Yes. When photographing horses – and I don’t control the location where I take photographs – most photographers would recognize that the color red is something that would immediately catch the eye. For instance, the orange traffic cones that are sometimes used on the grounds would be the first thing a viewer sees if I were to choose photographing those. SD: What is the primary drive when you build your composition? JH: I’m not very controlling about it. I really trust my eyes. I have done series of close-ups focusing on the body of the horse, the muscles, and the way the light falls, but I do not follow the traditional rigor of horse photography – traditional photography has very precise rules. 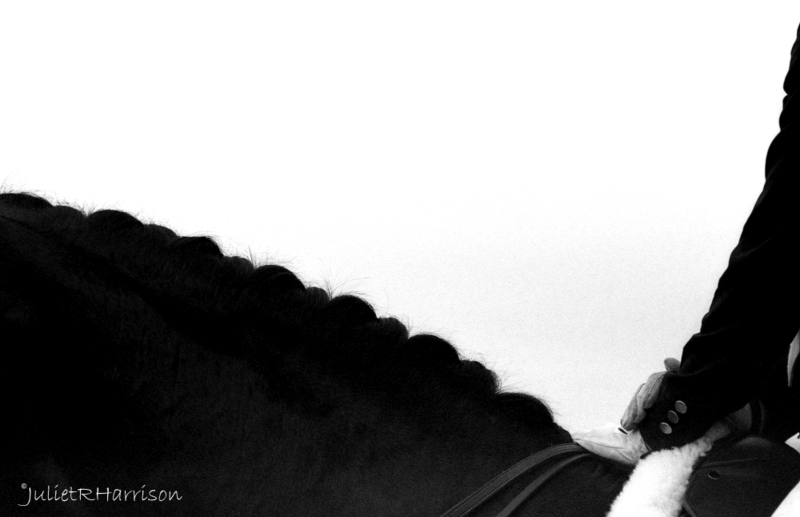 What I do is more modern, and aims to convey the personality of each horse, and my visual relation to it. SD: Let’s talk a little bit about equine art. I believe this goes back to pre-historic times: humans have always drawn or painted horses. Horse portraits and equestrian sculpture were actually very popular in the 18th century. In the 19th century equine art spread widely to include thoroughbred racing, jockey clubs, so forth and so on. Can you tell us what exactly makes this form of art so fascinating? JH: I think part of that is just the human connection to the horse. We as human beings would not have been able to advance our society, our culture, our world the way it is without the horse. Without the horse we would not have had agriculture the way we’ve had it, we would not have had transportation and human mobility in the way we’ve had it, we would certainly not have had war in the way it had been fought. If you look at the art of the horse, it is really a representation of the way we’ve moved through the world, and created our world through our relationship to the horse. One of the things that fascinate me is that horses are prey animals, but they allow us humans on their back, and right near their neck where predators would jump on them; it’s a pretty amazing relationship that we’ve developed with these animals, and that they trust us human beings in that way. For instance, monumental sculptures like Napoleon on a horse back, were done in a way that showed power. I think that the depiction of horse in art is a depiction of human history. © Kathi Peters. Contributed Photo. SD: Let’s briefly go over various equestrian art styles: some Renaissance artists like Leonardo da Vinci used to do studies, Baroque painters like Rubens used to paint royal scenes involving horses, Romantics like Géricault would paint war scenes, Impressionist artist Edgar Degas loved races, other artists preferred rural scenes. American painter Frederic Remington loved painting the American West. What can you tell us about the styles you’re fond of? JH: I’m really fascinated by contemporary artists. But I do certainly love the da Vinci’s horse studies – he spent hours and hours depicting the horse anatomy and attitude. I also love the work of modernist painter Franz Marc, who reduced horse painting to simple lines, but still conveyed the horse anatomy. I love contemporary artists that go beyond traditional equine art style; it’s important to be able to convey the correct anatomy and to have knowledge of the horse – an artist has to know how a horse moves, how the muscles and the bones move, and convey that on a painting. But I really do love art that goes beyond the literal representation, and conveys more either about the emotion of the artist, or the connection to the horse, the landscape, or something even more that goes beyond what is possible to define. 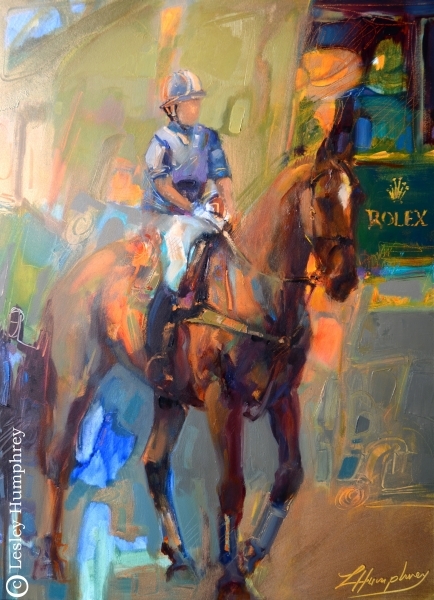 There is a tradition of horse portraiture or sporting events like polo, depicting horses either individually or at events, but I really do like art that goes beyond just the horse. © Alecia Barry Underhill. Contributed Photo. 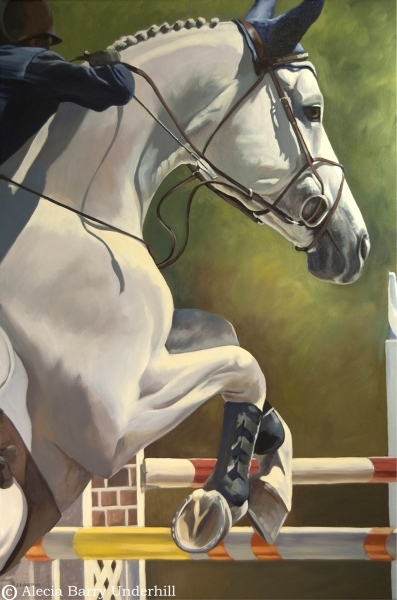 SD: The American Academy of Equine Art was founded in 1980 in Kentucky to promote equestrian art – I believe the Academy organizes one big exhibition each year bringing together leading artists in this field. Are you affiliated with this organization? JH: I am, and many of the artists I have worked with have been members of this Academy. Early on when I applied for membership they didn’t take photographers. Their mission is to exhibit art that is focused on the correct anatomy, and for the most part in the traditional representation of the horse. It’s an amazing organization; they also offer workshops that cover various aspects of equine art. SD: Let’s talk specifically about Equis Art Gallery. Where is located? When was it founded? What artists are represented in the gallery? JH: I opened the gallery just a year ago. It was a dream of mine to do so. Being an artist myself, I had a clear understanding of what an art gallery should be and should do; I also have thirty years of retail experience, so I understand that end of the business as well. I am part of a community arts organization that I helped found several years ago. We have a rented space here in Red Hook. I had an eight by ten feet space that I used for my photography, and I opened Equis Art Gallery in that space. I asked a number of my friends who are amazing equine artists to submit works. I received works from all over the world, and pretty quickly – about a month and a half later – I ran out of space, and rented an additional room. Now I represent twenty-seven equine artists from all over the world. I have paintings – oil, acrylics, graphite, sculpture, photography from countries like Germany, Italy, South Africa, Canada, and all over the United States. © Lesley Humphrey. Contributed Photo. SD: You also carry some vintage art. How do you collect those pieces? JH: Primarily the vintage art is what I’ve personally collected over the years. I rotate these at home, but there are also pieces that I’ve come to the conclusion that I don’t need to hold onto anymore. SD: How do you go about running your business: finding artists, attracting collectors, educating the public? JH: Like I said, I started out with artists that were personal friends, and artists I met through the Equine Art Guild, an online forum. I was the only photographer in that group, because the work I do is more fine art than commercial photography. After that, I started asking people whose work intrigues me. I have a rather non-traditional taste. Now I have artists – about five or six a week – that contact me, and ask me to represent them. I’m very limited by space, but I do have a nice waiting list. SD: When is the gallery open? JH: The gallery is open Friday and Saturday from 12 noon to 7 p.m., and Sunday from 12 noon to 4 p.m., and also by appointment. SD: You mentioned the word “space.” You are currently located at 7516 North Broadway, but I know you plan to move to a bigger location soon. Let’s talk about that. JH: Yes, I’d like to be able to represent more artists; the space I have now is very crowded. Also, I don’t have room for larger pieces that I’d like to carry. I am currently looking for a store front that would also give me more visibility. I hope to be at the new location by May. SD: Do you have any upcoming events you’d like to talk about? JH: Yes. I have one artist Diana Jensen – she is from Vancouver. She will be at the gallery for a reception of her work and demo on May 23. I also have another artist Karen McLain – a painter of mostly wild horses out West. Karen will be coming in November to do a demo. From May to December I will most likely have one artist reception per month. There will be information posted on the website. January may seem like forever up here in the mountains with cold, long nights, and not enough sun to keep us company. 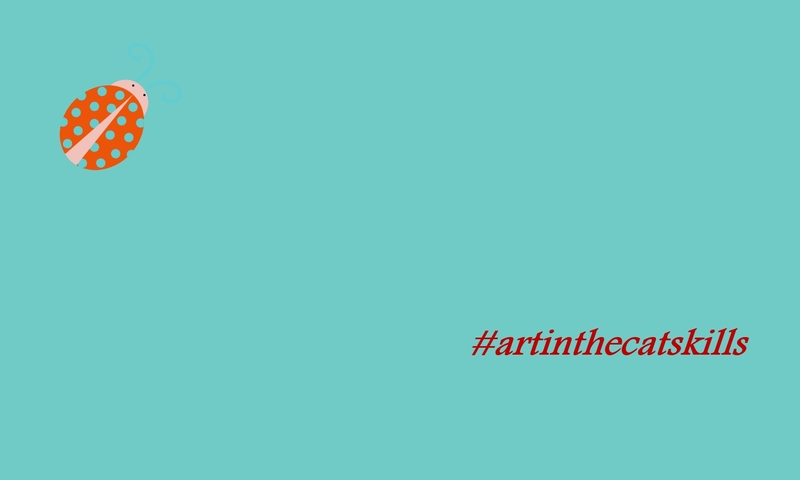 But there is art, and that is nourishing. Many events taking place this weekend: exquisite collections of art at the Hyde Museum in Glens Falls, quirky and fresh Creative Non-Fiction presented by Writers in the Mountains in Pine Hill, the 18th celebration of the Columbia County’s juried art show in Hudson, a family fun event in Monticello, and superlative theater performances in Albany. The Hyde Collection includes a wide array of art objects and antiques – paintings, sculptures, pottery, books and furniture – spanning thousands of years of civilization. It was established by Charlotte Pruyn Hyde and her husband Louis Fiske Hyde in their 1912 American Renaissance mansion in Glens Falls, Warren County. The collection includes works by Italian Renaissance masters Domenico Tintoretto, Raphael, and Sandro Botticelli; Spanish Renaissance painter, sculptor and architect El Greco; Baroque painters Peter Paul Rubens and Rembrandt van Rijn; French Neo-Classical painter Ingres; French Impressionists Edgar Degas and Pierre-Auguste Renoir; Post-Impressionist painters like Paul Cézanne and Vincent Van Gogh, as well as modern painters such as Henri Matisse and Pablo Picasso. American masters including Winslow Homer are also represented in this collection. In addition to its permanent holdings, the museum hosts temporary exhibitions and other educational programs. The Stone Palette: Lithographs in 19thCentury France exhibit just opened earlier in January, and will run through March 2015. Black and white, and color prints in a variety of techniques are included in this show. Also Wild Nature: Masterworks from the Adirondack Museum opened on January 18, showcasing sixty-two paintings, photographs and prints depicting American wilderness. Included in this exhibit are works by Thomas Cole, Sanford Gifford, Winslow Homer, Frederic Remington, and other American masters. Wild Nature will be on view through April 2015. The museum is open Tuesday through Saturday from 10 a.m. to 5 p.m., and Sunday from 12 noon to 5 p.m. For more information and current hours of operation, visit http://www.hydecollection.org/. 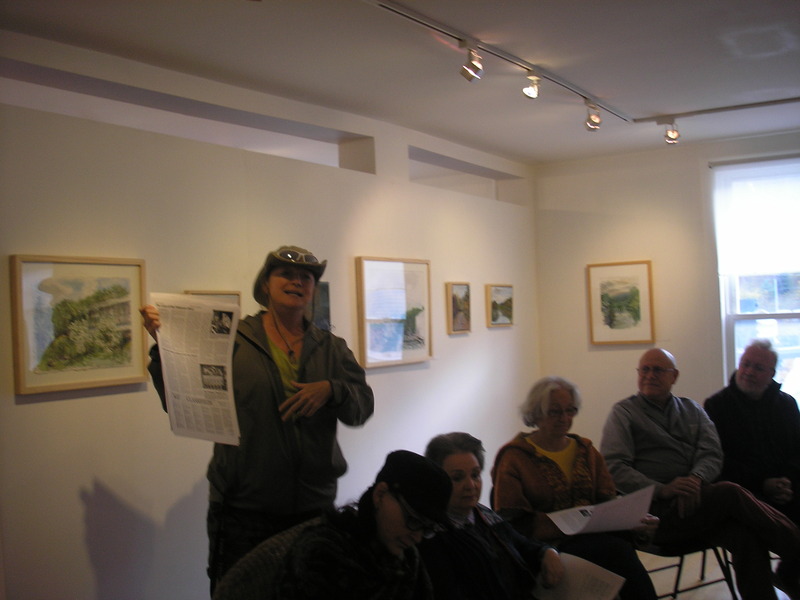 Writers in the Mountains (WIM), a premier literary organization in the Catskills, invites the public to a Creative Non-Fiction reading this Sunday, January 25 at 1 p.m. The reading, which will take place at the Pine Hill Community Center in Ulster County, will feature some of WIM’s best writers: Bonnie Lykes, Cheryl Holtzman, Evelyn Ellsworth, Ellen Stewart, Faye Storms, Gail Lennstrom, Judy Bloom, Geoff Rogers, Lillian Browne, Sharon Israel, and Theodora Anema. Great stories, light refreshments and good humor are a given. For more information about this event, visit http://writersinthemountains.org/. Sullivan County Chamber of Commerce presents its 9th annual Family Fun Day this Saturday, January 24 from 9 a.m. to 5 p.m. The event, which takes place at the Holiday Mountain in Monticello, includes activities such as skiing and snow tubing at discounted rates. A cardboard sled race begins at 1 p.m. The event will conclude with a free concert performed by Chelsea Cavanaugh. For more information, visit https://sullivancountynycoc.wliinc20.com/events/eventdetail.aspx?eventid=874. Capital Repertory Theatre, founded in 1981 in Albany, offers a variety of performances every year. Through February 8 the theater presents How Water Behaves, a comedy by Sherry Kramer, directed by Gordon Greenberg. Historical plays such as On-the-Go! They Built America! and Souvenir are presented throughout the month of March this year. Also, Shakespeare’s masterpiece Hamlet will be performed from April 21 to May 10. For more information, visit http://capitalrep.org. Founding member of Blue Mountain Gallery in Manhattan and Longyear Gallery in Margaretville, NY, Margaret Leveson is primarily a plein air painter, captivated by the Catskill Mountains scenery. Margaret studied at the NYU Institute of Fine Arts, and later on earned an MFA from Brooklyn College. She’s lived in the Catskills since 1977, when she and her husband David purchased J. Francis Murphy’s house in Middletown – Murphy was a famous 19th century landscape painter, whose works are displayed at the Metropolitan Museum of Art in New York City, the Art Institute of Chicago, the National Gallery of Art in Washington, and other places. I visited Margaret during the open studios tour on July 27 – she graciously opened her space to the public – a magnificent property with several different studios, and the main residence surrounded by a lavish garden. I asked Margaret what’s her favorite artistic manifestation these days. She likes to paint plein air, mainly oil on canvas: “I love oils because you can change them so easily. I also love to work in pastels. The problem with pastels is in framing and storage of the finished product. For me watercolor doesn’t have the same flexibility as either oils or pastels,” she says. Among her artists of reference is Wolf Kahn, known for his terrific color compositions. Next to Kahn, on Margaret’s desk I see art books featuring Matisse’s fauvism, and David Hockney’s and Tom Thomson’s works. Margaret’s plein airs have an impressionistic feel to them – the artist likes to apply color in oil sticks over the canvas or linen that is available. A new project is completed within hours, although sometimes it takes months to complete a more complex artwork. Photographs taken on site help the artist finish the project in the studio, but for the most part Margaret works from nature not from photographs – she thinks that photography doesn’t convey the light in a manner that does justice to the natural beauty. On the opposite wall there is a series of interiors painted with oil on linen – these were part of the Reflections art show hosted by Blue Mountain Gallery in Chelsea in 2013. They are done in a realistic, detailed manner – Margaret says that some of her paintings are more detailed than others depending on the mood and the feeling she wants to convey. Beautiful shades of purple and yellow draw the viewer in, when looking at paintings like “Night Light” or “Porch with Plants,” my personal favorite. For more information about Margaret Leveson, visit the artist’s website at margaretleveson.com.